The Tabernacle in the Wilderness was published in 1891 and since then from its pages several generations of believers have been introduced to the rich pastures of Old Testament typical teaching. This new revised edition has been commissioned and produced in the belief that such teaching is timeless in its relevance and applicability. It is presented in a style, format and language suited to modern day readers, especially for young believers in the twenty first century. As the different sections and structures of the Tabernacle are described, some very practical teaching for our daily lives is given, ranging from our need of salvation from sin to our present service for God. In addition to the very practical issues raised for our individual and corporate lives, the typical teaching of the Tabernacle all points to Christ, of course. He is the great subject of all Scripture. As we study the materials of the construction, the fabrics and the colours, the priests and the sacrifices, we are helped and encouraged to appreciate, worship and adore the person of our Lord and Saviour. This was the overwhelming objective of the original author, as it is the desire of all who have been involved in the production of this twenty first century edition. 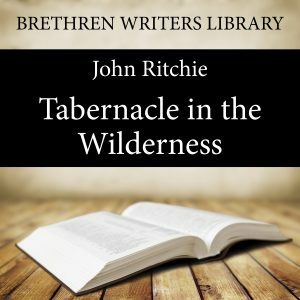 A word about the author: John Ritchie (1853 -1930) was born in Old Meldrum Aberdeen, Scotland in 1853 and was saved in 1871. He soon was engaged in full time preaching. In 1877 he married, and in 1879 moved to the town of Kilmarnock where he became engaged in writing and printing. He set up the publishing house still known as John Ritchie Ltd. His best known works are “The Tabernacle in the Wilderness” and “From Egypt to Canaan”.